If you haven’t ever visited a facialist in London before I would highly recommend it. It can be a really interesting experience and it’s a way to ask an expert questions all while getting a fabulous treatment – you can pick out tips and tricks and learn all about what your skin needs. Sarah Chapman is one of those London top facialist experts – in fact, London’s most sought-after facialist. Get an appointment with her and drop that word like social currency – this is the ‘it’ facialist we are talking about here! Sarah is the go-to for so many celebs and beauty editors and it’s no surprise that Sarah has her own skincare range called Skinesis – and a Skinesis clinic in Chelsea to boot! I’ve been wanting to try out the Sarah Chapman range for awhile as I’ve heard about her skills as a facialist so wanted to see if the products lived up to her name. Let’s start with the Skinesis Spot Stickers. First of all, I absolutely love these – so innovative and so genius. These are literally clear ‘spot’ band-aids or plasters that you put over your spot. It’s actually quite amazing that the spot sticker itself becomes almost invisible the moment you put it on your skin (make sure your skin is clean and dry). It flattens the spot and you simply need to apply the sticker on top and let it work its magic. I put this on a particularly large spot on my forehead (which I was not pleased about let me tell you) in the evening on my freshly-cleansed face. I then left it on overnight and took it off in the morning (although it is advised to change these and apply a new one every four hours). And guess what? The spot did seem less angry than the night before. The spot stickers help to calm redness, soothe, decongest & accelerate blemish healing. They also help to prevent you from picking and touching the spot. And men can use them too which is great. The most impressive thing? The invisible factor. Use them the next time you need spot SOS. Besides blemish-free skin who doesn’t want plumper lips? Okay we can’t all have a Kylie Jenner pout but hey, there are ways to certainly enhance what you’ve got naturally. Sarah’s got a Lip Enhancer which is really cool – it helps plump and fill lips so that they look fuller. I am a big fan of lip gloss in general and always thought a gloss really plumped out the lips so think of this as a super gloss. It’s also got a double-ended wand (great concept) so you can actually treat the contour of the lips where the loss of volume occurs in the first place. Skincare – but for the lips. I like it. The way to use this product is to apply the ‘Power Base’ first that you can use over the lips and around the contours to target volume loss and lines. Think of this as a first-step, lip primer. Then once you have applied this you can apply the Tint Balm on top for that natural flushed lip look. 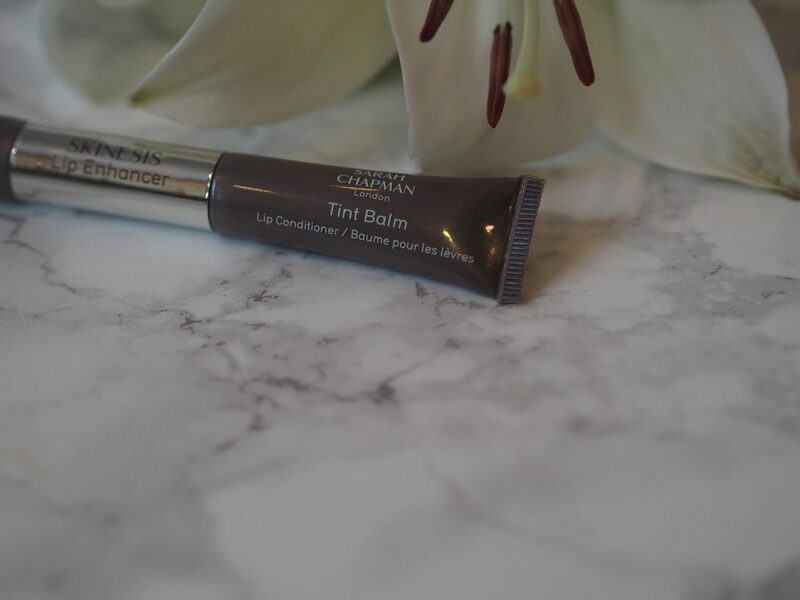 The Tint Balm works on the plump factor – hydrating and cushioning the lips with Volulip, Sym3D and Ultra-Filling Spheres. This product is fab for the coming weather as well – it’s already in my bag to help defend against the onslaught of coldness. The colour of the Lip Enhancer also adjusts to your own lips so the lips look really natural with just a hint of that ‘just bit my lips’ look (in a good way, of course). And finally besides blemish-free skin and plumper lips who doesn’t want firmer more glowing skin? Now let’s talk about the Skinesis Overnight Facial. This is a really interesting formula – it’s a hybrid serum oil which feels really luxurious on the skin. I really like this because it combines an oil and a serum – two of my favourite things! I also think this is the perfect in-between season skincare product due to the hybrid nature. It’s got the richness of an oil but the quick-absorption of a serum and leaves a velvety feel to the skin. The goal of the Overnight Facial is to be able to recreate the results of one of Sarah’s facials – but at home. My favourite thing about the Skinesis Overnight Facial is the velvety feeling that it imparts on the skin. To give that post-facial glow it contains antioxidants, vitamins, anti-inflammatory omega oils, peptides, a skin-brightening complex, and jasmine and rose. This is my new autumn skincare go-to! And last but certainly not least is the Skinesis Skin Tone Perfecting Booster. I’m a big fan of boosters in general as I think they add an extra oomph into your regime. I also like that you can add a booster to your existing skincare as they are meant to work even when they are mixed with other products. The Skin Tone Perfecting Booster is all about getting the perfect skin tone – i.e. smoothing out any hyperpigmentation issues (read my post about hyperpigmentation HERE) and I just loooove anything that targets uneven skin tone because an even skin tone is the ideal skin for me. You can use this alone as a serum or mix it into other products – i.e. moisturisers. I have even been known to mix boosters in with foundation. I like it when my make-up works hard for me too! This booster contains botanical skin brighteners with added anti-oxidants and Vitamin C. Think of it as a cocktail elixir for the skin – I really like it! Don’t forget to follow me on Instagram/Twitter/SC for all my latest adventures! Previous Post Mission: Target Dark Spots (and what I used)! Next Post Why I Love Cushion Foundation!